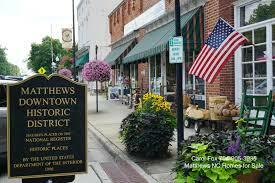 Incorporated by the North Carolina State Legislature in 1879, Matthews has grown from a one square mile town with 191 residents to 14 square miles and a population over 26,000. Matthews is the corporate headquarters for many major companies, including Family Dollar, Harris Teeter, Conbraco, Carotek, and Intelicoat. Matthews is also home to The Levine Campus of Central Piedmont Community College and the Wingate Universite Matthews Branch, providing both undergraduate and graduate degrees. It has a charming main street filled with shops and dining, as well as a thriving farmers market.